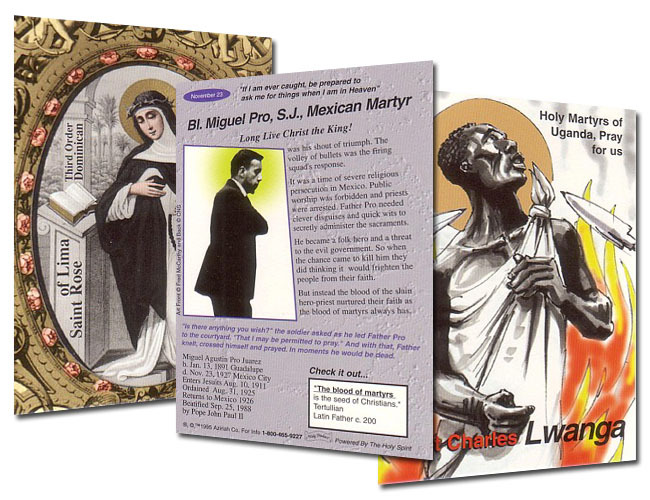 The cards of Set #2: St. Agatha, St. Bernadette, St. Catherine of Siena, St. Catherine Laboure, St. Charles Lwanga , St. Dominic, St. Edmund Campion, St. George, St. Hallvard, Bl. Jeanne Jugan, St. Jerome Emiliani, St. Joan of Arc, Bl. Kateri Tekakwitha, Bl. Katherine Drexel, Bl. Miguel Pro, St. Pierre Eymard, St. Peter Donders, St. Rita of Cascia, St. Rose of Lima, St. Sharbel Makhlouf, St. Teresa de los Andes, St. Teresa of Avila, St. Thomas Aquinas, St. Thomas Becket.